Just finishing (by audiobook) Stay the Course and am now starting “The Bogleheads’ Guide to Investing!” I already read the Bogleheads’ Guide to the 3 Fund Portfolio. Yes, I’m late to the party but I’m finally here and learning all I can! Excited to say all of my investments are in route to Vanguard (from Merrill Lynch) where I’ll be putting what I’m learning into practice! Going Dark, by James W. Hall. In South Florida radial eco warriors plot to shutdown a nuclear power plant, while federal agents work at cross purposes to each other, and power company security employees conspire. John Sandfords- "Holy Ghost"....Virgil Flowers investigates shootings in a small Mn. community somehow tied to the appearance of Virgin Mary apperition. Not as good as past books by Sandford. I am assuming that we have a significant number of baseball fans in this forum. If you are one of them, you are going to want to obtain a copy of this new biography of George Herman Ruth Junior. Leavy has really done her homework in documenting the Babe's life and times; I counted 78 pages of notes, interviews, and sources. The biography is weaved around an accounting of a nationwide barnstorming tour that Babe and Lou Gehrig embarked upon in 1927. In addition to lots of factual stories about Ruth, the book is also an accurate history of how Americans lived their lives in that tumultuous decade. A very engrossing read. Lessons from Lucy, by Dave Barry. Funny, self-help life lessons learned from his dog Lucy. Personal Memoirs of U. S. Grant - the relatively new annotated edition from Harvard University Press. Annotations are extensive, particularly about every named individual in the memoirs. Its a well-produced book, good paper, good page layout, reasonable type size. Good dust jacket, fairly blah binding. I think this is the fourth time I have read this book in the last 50 years - beginning with a copy of the original Charles Webster 2 volume edition, and including the Library of America edition and a free ebook version on my iphone during a series of bus trips. Obviously I like the book. The annotations in this edition are interesting but not essential to the non-specialist. A fascinating look at the history of printing and production of books. Unfortunately, somewhat marred by the author's adding frequent attempts at pre-teen humour to the text - really dragged down the quality of what is otherwise a hugely engaging read. Personal Memoirs U.S. Grant, one of my favorite books. He was his own best biographer. Two-thirds of the way through On the Road. I was really hoping for something inspirational, but thus far I think it's just crap. Just started Bogle's Stay the Course. RIP. Really good and very eye opening. Just finished two fascinating histories which I admit that I skimmed through in parts. Sometimes just too much information. The Catalogue of Shipwrecked Books by Edward Wilson-Lee, being a biography of Hernando Colon, son of Christopher Columbus, and the wonderful largest library in the 16th century that he created in Seville. I am an unabashed fan of Christopher Columbus and now am a fan of his son. Recommend for anyone interested in that epoch or in libraries and book collecting. Though suggest first reading the classic Admiral of the Ocean Sea by Samuel Eliot Morison. And just finished Armies of Deliverance, A New History of the Civil War by Elizabeth Varon, an eminent history professor at the home of the new national championship basketball team. And it is a new take on the civil war, focusing on the growing public perceptions in the North as a war to end slavery and also focusing on the public perceptions of the conflict in the confederate states. Furnished many new insights into the conflict especially as to the role of media and public spokesmen and politicians in framing the conflict. Recommend for civil war fans. 4) the Scots-Irish from the border region of England and Scotland, and from Ulster in Ireland, to the Appalachian mountalns and points west. The book came out in 1988, and still rings true. It is 972 pages, about half being end-notes. It covers each group's religion, language, food, courtship, marriage, occupations, building style, treatment of the elderly, power structure, and concepts of virtue, justice, and liberty. It explains a lot of historic and present-day American socio-political conflicts in terms of these distinctly English and distinctly different cultures rubbing up against one another. It notes that later immigrants tended to absorb the English cultural attitudes of the region they came to. Fischer intended to write, in similar depth, about the immigrations of these later arrivals. Regrettably, these books remain unwritten. I was led to Albion's Seed by James Webb's Born Fighting: How the Scots-Irish Shaped America. I'm now starting on Thomas Sowell's Black Rednecks and White Liberals, which references Albion's Seed pretty often. I took a break from Albion's Seed to read Jordan Peterson's 12 Rules for Life: an Antidote to Chaos. Beautifully written crap, though. I always think of this book when I see posts from Dean Moriarty. Thank you for this summary. My mother left behind a paperback copy of Albion's Seed when she passed away. I decided to keep this one until I had time to at least skim and read key sections. It stuck out on the bookshelf not only because of its size but because it was so different than most of her collection ( short stories poetry and award worthy recent fiction) and my own preferences (science & nature & western history). I decided this must make it significant for both of us. Just finished The River by Peter Heller. Two college student friends who are avid outdoorsmen plan a several week long canoe and portage trip in northern Canada where they get dropped off by float plane. Do not expect to encounter attempted murder by another canoe group and raging forest fire. As someone who went with bride on 10 day canoe and portage trip in Canada many years ago this brought back memories. Without the attempted murder and forest fire. A fast paced adventure yarn, recommend to anyone who has been on or yearned to be on a Canadian canoe and portage trip. Good luck. Picked this one up on my kindle for a recent plane trip. 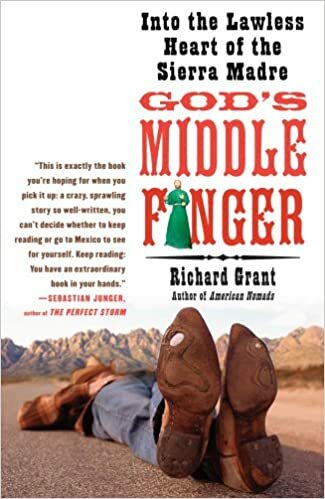 It is about Richard's attempts to explore the heart of the Sierra Madre mountains of Mexico where the drug trade is the primary source of income. In Search of the Obvious by Jack Trout. Just finished reading The Trap by Sir James Goldsmith, an English billionaire. Even though the book is written in 1994, it's remarkable how prescient the author had been about many issues affecting the world today (Globalization, wage squeeze, Eurozone, Brexit, GMOs, Industrialized Agriculture etc). Irrespective of your political views, I think this book is going to be an eye opener. Now reading "Lethal White" the fourth installment of the Cormoran Strike series by "Robert Galbraith". I'm of mixed feelings on this series so will comment after I finish, or if I finish the current book. Before the Dawn by David Reich. I'm up to History now, yay! I'm hoping he can knit history and pre-history together. Though the 2006 book is already terribly out of date. I started re-reading Jack Bogle’s “The Clash of the Cultures”.